POLYPIPE Manufacturer's Part Number: SCB105SG. POLYPIPE System 2000 Solvent Soil & Vent Fitting - Ø110mm/4'' Triple Socket Equal 92.5 degrees Corner Branch with 2 boss shoulders; Solvent Grey. - Polypipe Soil & Vent: Solvent Soil & Vent equal single branch, used for joining double branch pipes to vertical pipe at 92.5 degrees angle in a corner position. - Connections (Top x Branch x Branch x Bottom): Solvent Weld Socket x Solvent Weld Socket x Solvent Weld Socket x Spigot (fits into another socketed pipe, fitting or connector). 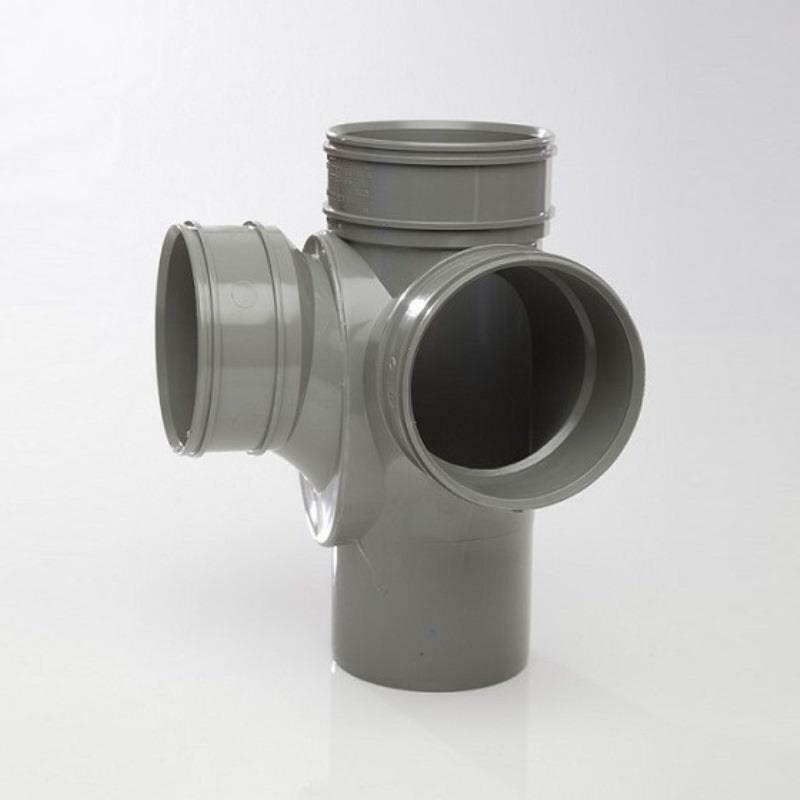 - 2 x Ø60mm boss shoulders/sockets: All boss shoulders provided are a common size and will accept Ø32mm, 40mm and 50mm waste pipes using a comprehensive range of boss adaptors; where a boss shoulder is moulded solid, it should be drilled through with a Ø60mm hole saw. - Colour: Solvent grey, to match the colour of grey solvent soil & vent pipe & fittings.